Please click here for the full scenario text. These scenarios look forward to 2025. Economic growth will, on average, probably be slower than any enjoyed between the 1970s and the 2008 crisis. There are four depressing factors: first, of course, the current debt overhang, combined with state deficits. 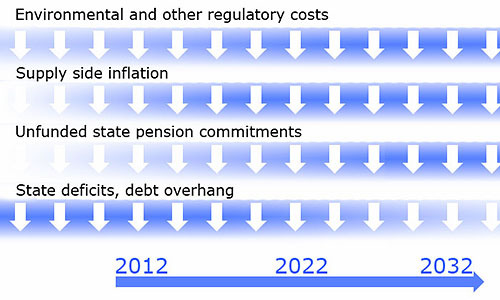 Second, there is an unavoidable, immense fiscal crisis looming in the 2020s, in the shape of demographic change and unfunded pensions. Third, supply side inflation will occur around minerals, energy and food whenever growth does manage to pick up. Finally, the need to meet environmental constraints will, whatever the positive rhetoric, cost around a percent off potential growth to compliant nations. Additional to these, the Eurozone situation has the potential to drag on for a decade, perennially threatening catastrophe. World conditions are therefore sluggish or slow. Companies do, however, access both very large cash reserves and five years of accumulated ideas and technology. Their indecision about investment is due to more than economic uncertainty. Their management - and commentators at large - feel that a watershed has been crossed, that something deep has changed. It is hard for them to envisage a return to the situation in the 1985-2005 period without something going wrong. Our diagnosis is that the social narrative, the network of implied relationships and values that underpin society, has been based on a level and form of welfare that is no longer tenable. At the same time, competitive forces mean that whilst low skill wages are generally static or falling, returns to high abilities are increasing. The surface symptom of this is inequality, but the deep issue is how to manage a rich society in a world where low skill jobs are benchmarked against automation or low wage nations. This issue has been in existence since the early 1990s, but it was papered over by social transfers and by debt. Many social transfers were themselves based on debt. This can no longer be permitted to occur at the same level, and will be even less possible as age-related deficits begin to affect the industrial nations. In a low growth world, the issues are likely to be amplified. Turning to China, we note that a transition is planned between an export-led economy and one based on internal consumption and greater social welfare. There are other important political transitions to be made. At the same time, Chinese demographics are worsening and labour supply is tightening. A considerable head of political steam has built up in Chinese society as a result of the many difficult and radical changes that it has made in the past thirty years. Many of its workforce closely resemble Marx's industrial proletariat. It will be necessary to allow wages to rise in order to fund the consumer society, and it is far from implausible that in a low growth, unstable world, China may see sudden labour organisation, soaring wages and greater costs. This scenario also enables the middle classes from the emergent economies to discard Western values as bankrupt, and it gives them their period in the sun. International political discourse therefore moves to a style that closely reflects aspirations and social values of the middle classes of the emerging economies, all of them determined not to be 'undermined' as was China. This scenario is called Old Narrative 2.0: a new, punitive-populist version of the former narrative, with which we began. It triggers many negative economic drivers, which in turn make the situation worse. (The various European fiscal crises, and indeed the Euro project, are untenable in this world, Nations will diverge and Nationalism will re-ignite.) We have not tracked this case to its worst possible destinations, but clearly once it is started it is hard to stop, and its consequences in the anyway innately brittle period around 2025 will be to amplify risks and instabilities. It will certainly not offer leadership on systems issues, such as the environment, security and financial stability. The red star represents the present, the blue arrow the lack of an adaptive solution to globalization. 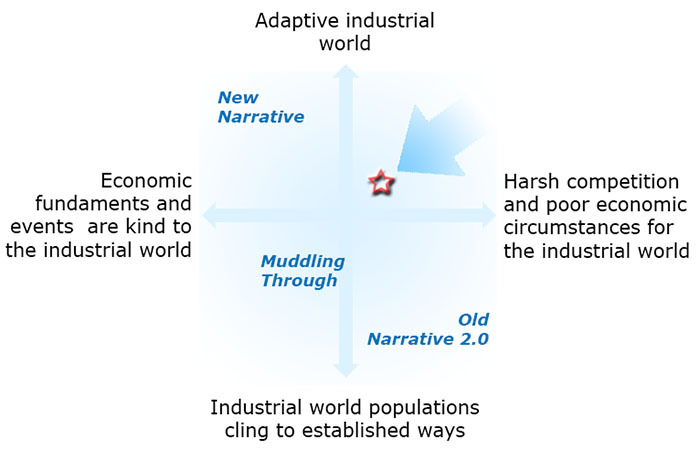 The trajectories that the scenarios follow are developed in the main text. These are gloomy models. However, the problem is not so much the current situation itself so much as how we react to it. If we address systems issues in a systematic manner, we may be able to make each of them tractable. Science is uncovering wonders, many - as in biology, in artificial cognition, in energy supply and transformation - potentially of huge economic significance within the period to 2025. We are beginning to understand how the innovation process runs, and how to predispose societies to be effectively entrepreneurial. We are learning how to educate and use people better. What holds us back in each of these areas of potential is not so much funding or even organisation, but attitude. Our attitude to the complex that is society, the state and commerce defines how we react to initiatives from each of these. Our tendency to resolve issues either by means of systems management, or else through pragmatic fixes cooked up in back rooms, clearly defines how well the resolution of complicated issues will occur. How we approach national politics, regulation, tax; and legals issues such as liability, risk and intellectual property press the on the commercial accelerator or on the brake. The scenario called New Narrative puts flesh on these bones. It offers a way of thinking that takes us out of the cul de sac that we have seen holds back our optimism about the future. In a mental checklist of the problems of the future, it ticks of all the items as having a solution. We have given an entire paper over to describing some of the elements of the New Narrative, and this is, we hope, a great deal more than offering an "in one bound" solution to the dreadful impasse that we otherwise face.